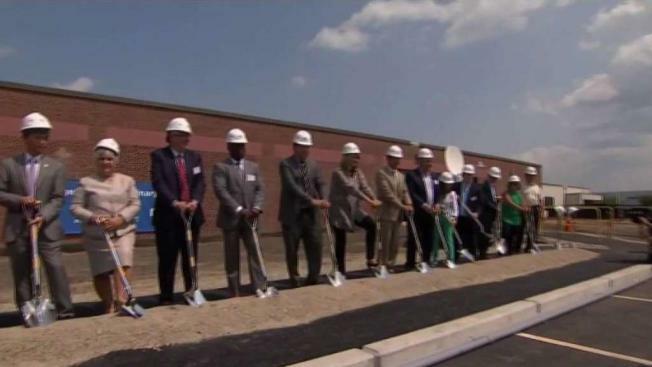 NBC10 Boston, necn and Telemundo New England took part in a groundbreaking ceremony for the new facility in Needham, Massachusetts. NBC10 Boston, NBC Sports Boston, Telemundo Boston and necn broke ground Thursday on the “NBCUniversal Boston Media Center” — a new multi-million dollar, state-of-the-art 160,000-square-foot news and content creation center located on 189 B St. in Needham, Massachusetts. The new media center was formerly the General Dynamics building located in the Needham Crossing Business Park. The building will be part of the N-Squared Innovation District and will bring together approximately 390 NBCUniversal employees from four separate offices across the Boston area and New England, under one roof. Boston area employees were joined by NBCUniversal executives, state and local elected officials, as well as Needham business partners to celebrate the largest investment ever made by a media company to build out the most advanced broadcast facility in the Greater Boston area. “We are thrilled that NBC Sports Boston will join our sister stations NBC10 Boston, Telemundo Boston and necn in a new world-class, state-of-the-art media center next year," said Princell Hair, general manager of NBC Sports Boston. “This co-location will allow us the opportunity to collaborate and take advantage of the best, most up-to-date technology to deliver the best news, sports and content to our viewers and fans across multiple platforms." In attendance to celebrate the stations’ milestone were state Rep. Denise Garlick and Nam Pham, assistant secretary of business development and international trade for the state of Massachusetts. Also in attendance were Dan Matthews, chair of the Needham Select Board; Needham Town Manager Kate Fitzpatrick; Greg Reibman, president of the Newton-Needham Chamber of Commerce; and Chuck Tanowitz, director of the N-Squared Innovation District. NBC10 Boston, NBC Sports Boston, Telemundo Boston and necn are working with Boston area’s Lee Kennedy Construction as well as Gardiner & Theobald Construction and architecture, design, planning and consulting firm Gensler, to build the most modern media center in the region. At unveiling, the NBCUniversal Boston Media Center will feature the most cutting edge broadcast technology and will be designed to be energy efficient. The new media center will house six studios and will be built to suit employees’ needs. The new facility will distinctively celebrate the individuality of four individual NBCUniversal businesses while allowing employees to enjoy and access open spaces, quiet/focus rooms, mothering rooms, a Doctor-On-Demand room, working café and coffee bars as well as a healthy market and kitchen, two outdoor courtyards, and a dedicated fitness facility. Additional building and technology features will be announced closer to the media center’s unveiling in the fall of 2019. Continuing its series of investments made to its local news and sports stations divisions, plans for the new “NBCUniversal Boston Media Center” follow the recent unveiling of new, state-of-the-art local television news facilities in various markets across the country including The Brokaw News Center in Los Angeles (KNBC/KVEA), The Studios at DFW in Dallas-Fort Worth (KXAS/KXTX), and other new modern news facilities in West Hartford (WVIT/WRDM), Denver (KDEN), San Antonio (KVDA), McAllen (KTLM), San Diego (KNSD, KUAN) and in Philadelphia when NBC10 (WCAU) and Telemundo 62 (WWSI) move to their new state-of-the-art news center within the new Comcast Technology Center, this fall.